Rule of law and security institutions, both national and local, are vital elements for stabilizing countries and bringing sustainable peace. Through systematic and targeted measures, UN Peacekeeping addresses the situation of those individuals and communities most affected by conflict, with the overarching goal of assisting national political processes, conflict resolution and stabilization. UN Peacekeeping assists countries to strengthen the rule of law by restoring and maintaining security, protecting civilians, paving the way to peacebuilding, reconstructing communities and creating the enabling conditions for sustainable peace. Rule of law activities in peacekeeping are people-centred initiatives. They are tailored to local realities and assist communities to produce concrete peace dividends, such as access to basic services through mine/explosive hazard removal. UN Peacekeeping also supports the rule of law by providing interim stability or security measures, such as mixed patrols in Mali, local ceasefires in Darfur, informal and community-led security arrangements in Abyei, local peace agreements in the Central African Republic and targeted community violence reduction programmes in Haiti. In countries emerging from violent conflict, the threads that hold society together, along with a sense of trust and justice, can be badly damaged. For example, armed combatants may roam free, while local police may be feared and old grievances continue to simmer. OROLSI includes five components Police Division; Justice and Corrections Service; United Nations Mine Action Service; Disarmament, Demobilization and Reintegration Section; and Security Sector Reform Unit. On the ground, more than 15,000 rule of law and security professionals are fulfilling a wide range of essential tasks, including national capacity and institution building. Police peacekeepers patrol crime hotspots alongside officers from national law enforcement agencies. Weapons experts educate civilians on the risks of explosive hazards. Judicial and corrections officers help ensure that all citizens be treated equally under the law. DDR specialists help former fighters reintegrate into society. Security sector reform advisers ensure that oversight and accountability are built into police, defence and intelligence services. OROLSI is first and foremost, field- oriented. The Office is currently present in the following 11 UN peacekeeping operations: MINUSCA (Central African Republic), MINUSMA (Mali), MONUSCO (Democratic Republic of Congo), UNMISS (South Sudan), UNAMID (Darfur), UNISFA (Abyei, South Sudan), MINUJUSTH (Haiti), UNFICYP (Cyprus), UNMIK (Kosovo), MINURSO (Western Sahara), and UNIFIL (Lebanon). 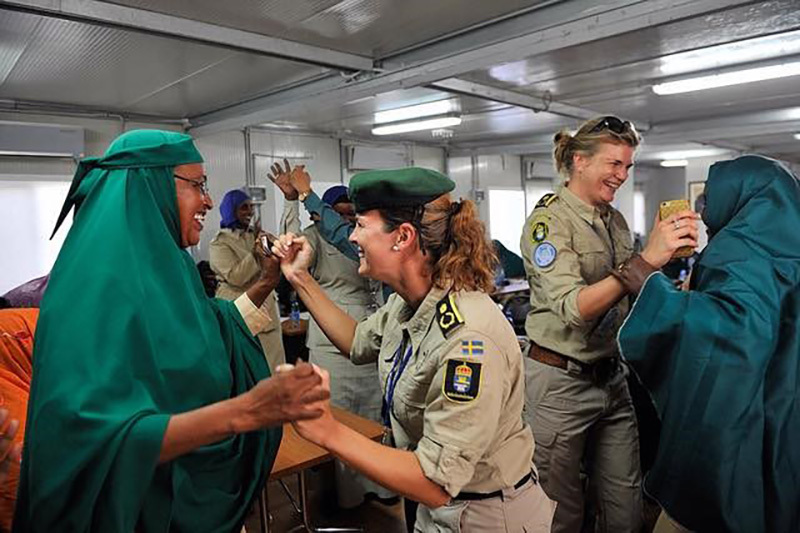 In addition, OROLSI is also providing support to 10 special political missions: UNSOM (Somalia), UNSMIL (Libya), UNAMI (Iraq), UNAMA (Afghanistan), UNIOGBIS (Guinea-Bissau), UNOAU (African Union), UNOWAS (West Africa and the Sahel), UNVMC (Colombia), OSESG-Y (Yemen), OSESG-B (Burundi). OROLSI has established nimble standing capacities with expertise in policing, justice and corrections. These teams can deploy within seven days to support newly established peace operations, support missions in times of crisis, help provide surge capacity and otherwise respond to needs as they arise. OROLSI has also generated other quickly deployable capacities through rosters, rapid reaction teams and similar stand-by arrangements. The Justice and Corrections Standing Capacity is part of the Justice and Corrections Service. It is a small team of rapidly deployable justice and corrections experts, who assist justice and corrections components in United Nations peace operations (particularly during mission start-up, surge, and transition phases). The United Nations Standing Police Capacity is the rapidly deployable operational wing of the United Nations Police Division tasked with providing the start-up capability for the police components of new United Nations peace operations, along with providing advice, expertise and assistance in the field of institutional law enforcement capacity building. The second task has, over time, evolved in line with the requirements of the United Nations system, as recognized in Security Council resolution 2382 (2017), which welcomed the support of the Standing Police Capacity to other United Nations entities through the Global Focal Point for Police, Justice and Corrections arrangement, as well as its work in providing rapid, coherent, effective and responsive start-up and assistance capability for police components in peace operations. Both OROLSI Standing Capacities are based in Brindisi, Italy. 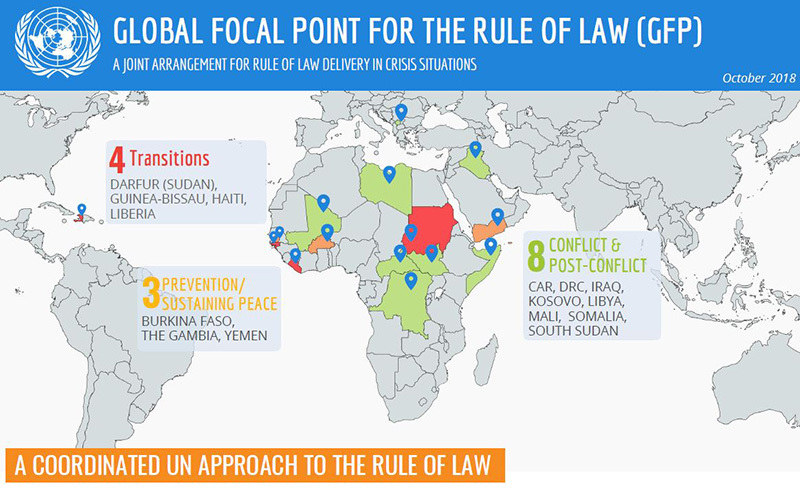 A positive example of an integrated, delivery-oriented approach is the work of the Global Focal Point for Police, Justice and Corrections Areas in the Rule of Law in Post-Conflict and Other Crisis Situations. The main tasks of the Global Focal Points are to jointly asses and plan for rule of law country-specific plans on the basis of comparative advantages of the entities involved. This collaborative framework also includes the United Nations Office on Drugs and Crime (UNODC), the Office of the United Nations High Commissioner for Human Rights (OHCHR), UN Women and other UN partners. Since 2012, the Global Focal Point for Police, Justice and Corrections Areas in the Rule of Law in Post-Conflict and other Crisis Situations (GFP) has brought together complementary capacities in efforts to improve delivery on the ground with a view to preventing the outbreak, escalation, continuation and recurrence of violent conflict. 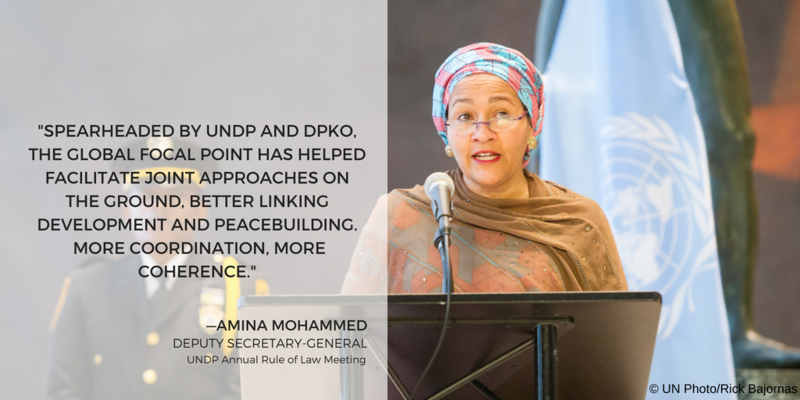 The Department of Peace Operations (DPO) and the United Nations Development Programme (UNDP) have been entrusted, through the appointment of the Secretary-General, joint responsibility to convene UN entities in order to respond to country-level requests. Key Global Focal Point partners include OHCHR, UN Women, UNODC, and UNHCR while other United Nations agencies contribute expertise in accordance with their roles and mandates. As a result of OROLSI's efforts, UN Peacekeeping today also has an increased role in the area of conflict prevention, prevention of violent extremism, counter terrorism, stabilization and peace sustainment and local/community dynamics. 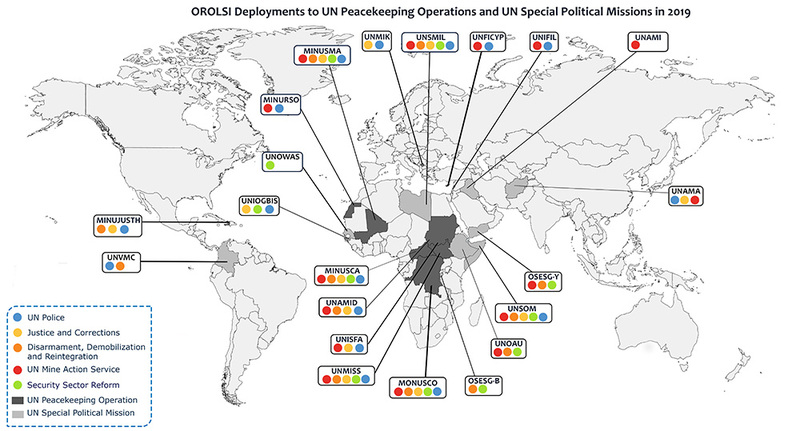 Working together, OROLSI’s five components provide holistic support to United Nations peace operations and special political missions, providing a full cycle of related activities, from doctrine development, capacity building, community liaison, training and generation of personnel to technical expertise, lessons learned and transition planning. Working side-by-side with national authorities, a focus on the rule of law and security institutions can guide countries on the difficult road from conflict to sustainable peace. Experts from OROLSI’s Justice and Corrections Service and Police Division; Office of the High Commissioner for Human Rights (OHCHR); and the United Nations Development Programme (UNDP) are part of a Team of Experts on the Rule of Law and Sexual Violence in Con­flict (Team of Experts), which was created under Security Council resolution 1888 (2009). The Team of Experts focuses its efforts on strengthening the capacity of national rule of law and justice actors, including in specialized areas such as: criminal investigation and prosecu­tion; collection and preservation of evidence; military justice sys­tem investigation and prosecution; criminal and procedural law reform; and protection of victims, witnesses and justice officials. To date, the Team of Experts has supported national authorities in a num­ber of countries, including the Central African Republic, Colombia, Côte d’Ivoire, the Democratic Republic of the Congo, Guinea, Iraq, Liberia, Mali, Somalia and South Sudan. 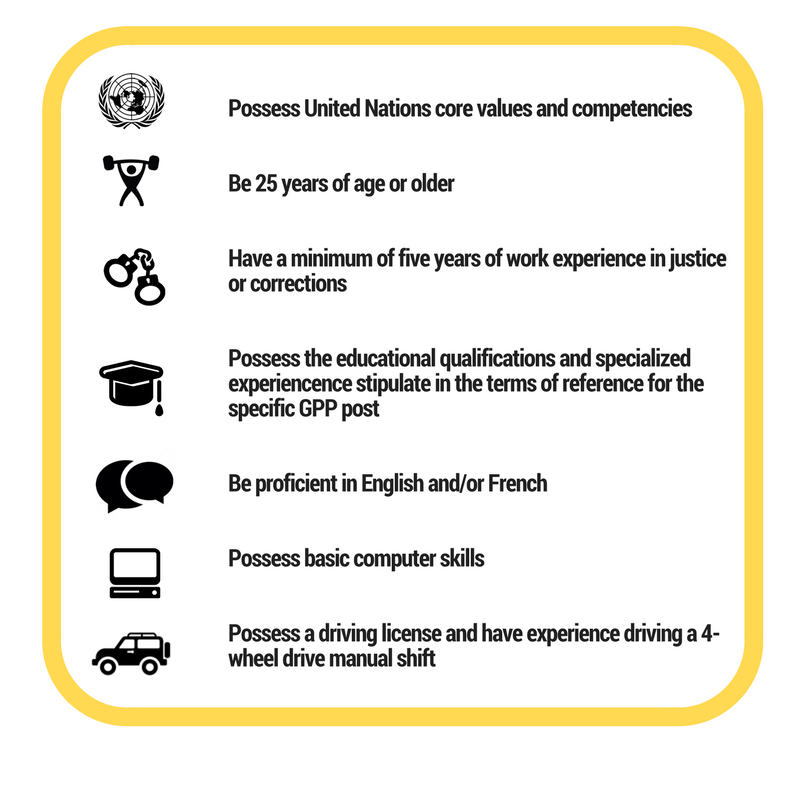 Government-provided personnel are experts nominated by their government for service with United Nations peace operations. The use of government-provided personnel - individuals with specialized expertise, key knowledge and skills - is a means of benefiting from the expertise of governments of Member States required by the United Nations to carry out the mandates of peace operations. Government-provided personnel most commonly provide advisory, capacity-building and mentoring support to national counterparts in specialized functions for which expertise is required. Such niche expert skills are generally only found in government services and thus most effectively drawn from Member States. Government-provided personnel bring a wide range of expertise to peace operations, including in military justice and prosecutions, training, custodial management, prison security and policy development. Justice and corrections experts interested in serving as government-provided personnel with United Nations peace operations must be nominated by their governments. The Justice and Corrections Service is the designated focal point for all issues related to the selection, recruitment, deployment, rotation, transfer and repatriation of justice and corrections government-provided personnel. The Justice and Corrections Service routinely issues calls for nominations of experts for service as justice and corrections government-provided personnel. The nomination of women and French-speaking candidates is particularly encouraged. Selected officers most often serve for an initial period of 12 months, with the possibility of a six or 12-month extension. Contributing Member States continue to pay the national salary and entitlements of the officers during their deployment. In addition, the United Nations provides Mission Subsistence Allowance and medical coverage, and assumes deployment and repatriation costs. For additional information, please contact jcs-secondment@un.org.